In 1967, GO Transit started out as a simple commuter service from Oakville to Pickering (with two additional trains to and from Hamilton). In 1970, it started its first bus service, connecting Oshawa and Hamilton to the hourly train service at Pickering and Oakville. Eventually, GO expanded to other corridors, inaugurating the Georgetown service in 1974, and taking over former suburban Grey Coach and TTC routes in the 1970s. By 1981, GO was operating trains on all seven of its current corridors, expanding and extending its bus rail services ever since. As a commuter rail and bus system, GO Transit is a great success story, there were over 68 million boardings in 2014, and service continues to expand. Regular bus service goes all the way to Niagara Falls, Peterborough, and Waterloo, serving post-secondary institutions and long-distance commuters. But there are many ways in which it can improve; its fare structure is just one of them. Previously, I explained why GO Transit should consider charging for parking at its commuter lots. GO Transit provides over 60,000 free parking spaces, but the cost of servicing those lots is borne by all passengers, whether or not they drive to the train or not. This isn’t terribly fair to those customers who arrive by foot, by bicycle, or are able to get a ride. In the suburbs outside the City of Toronto, most transit agencies offer a co-fare – a discounted fare for taking local buses to connect to and from GO Transit, but no such fare integration exists with the TTC. But the parking subsidy enjoyed by drivers is only part of the unfair pricing scheme levied by GO Transit. GO Transit describes its fare scheme as “fare by distance.” And to a degree, this is accurate. Generally, the farther one travels, the more expensive the fare. So far, so good. But fares for short trips cost far more than longer ones per kilometre traveled, and fare increases for short trips have risen at a greater percentage rate than fare hikes for long trips. If GO Transit wishes to fully become a regional transit service, it needs to address both its unfair fare scheme and its lack of fare integration with the TTC. I created a map of the full GO transit bus and rail system in CartoDB to illustrate GO Transit’s reach; all stations and major bus stops include some fare information (the distance and cash fare to Union Station) and the number of parking spots. GO Transit has nearly eighty fare zones, numbered from 02 to 97, and each bus stop and rail station is assigned to one of those zones. Zone 02, for example, is Downtown Toronto, and includes Union, Exhibition, and Bloor Stations and the Union Station Bus Terminal. Zone 97 is Newcastle, which is the western terminus of the Lakeshore East bus service that connects to Oshawa Station (which is in Zone 94). Zones 02 to 09 are in the City of Toronto, zones 11 through 97 are elsewhere. When the zone fare system was first implemented, they were designed to represent the distance from Union Station on each of GO’s seven rail corridors. On the Georgetown (now Kitchener) Corridor, Malton was Zone 31, the first station on the line outside of the City of Toronto, 32 Bramalea, 33 Brampton, and so on. The first digit on the Milton Corridor’s zones started with a 2, Stouffville with a 7. But as the bus and networks extended, and the new Highway 407 bus services begun in September 2000, GO’s zone fare system, which was based on the distance from each suburban rail station to Union Station, became more problematic. For many years, fares on the Highway 407 bus service, centred on York University, had little to do with distance traveled as they were based on this outdated zone system. For over a decade, the fare from Square One to York University was the same as between Bramalea GO Station and York, even though Bramalea is half-way between the university and Square One. (This was eventually addressed, York University was eventually assigned Zone 19, and today the cash fare differential for the fare from York University to Bramalea 0r Square One is 70 cents.) New zones, with numbers outside of the old radial numbering scheme) had to be created for new non-linear destinations, or new destinations far from Union Station, such as Niagara Falls (Zone 84), Peterborough (Zone 30), and Kitchener-Waterloo (Zone 27). Currently, the base GO Transit fare is $5.30. This is the single-ride adult ticket price for travel within a single zone, such as between Union Station and Exhibition, which are both within Zone 02. There are discounts if using a Presto card, approximately 10% off the applicable cash fare (in this case, the adult fare is $4.77, the student fare $4.39), and seniors and students pay half the single ride fare ($2.65). After 35 rides in a month, the adult Presto fare is reduced considerably, and after 40 rides in a calendar month (the equivalent of 20 business days’ commuting), the fare is free for all fare categories; this allows Presto to replace the old paper monthly passes. I only use the base adult single-ride fare for comparative purposes in the graphs and tables below. With such a high base fare ($5.30), short trips are more expensive than longer ones per distance traveled. The fare from Union to Exhibition, only 3.2 kilometres away, is $5.30, but Mimico, 10.8 kilometres away, is $5.60. The discrepancies in fare per distance traveled only increases the farther one travels from Union Station. The most expensive fare from Union Station ($18.50) is Peterborough, which includes Trent University. With a bus connection at Oshawa, Trent is 138.6 kilometres from Union Station by rail and road. GO Transit fares per distance traveled. The problem of GO’s not-quite-fare-by-distance fare model is especially clear when I calculated the cost per kilometre traveled. The fare from Exhibition Station to Union Station is $1.66 per kilometre traveled, while the fare to Allandale Waterfront Station, the last stop on the Barrie line is $13.70, or $0.13 per kilometre traveled, as is Trent University. The cheapest trip, as it turns out, is from Union Station to Beaverton, 133.3 kilometres away (with a transfer to a bus at Whitby). The fare, $14.90, works out to only 11 cents a kilometre. It should be acknowledged that the trip from Union Station to Exhibition can also be made on the 509 Streetcar for a $3.00 cash fare ($2.80 with a token), and the streetcar takes approximately 20 minutes, while the train takes less than 10. Mimico and Long Branch are also served by the TTC surface network, but by TTC, Mimico is 45 minutes to an hour via streetcar, or bus/subway, and Long Branch is a 20 minute train ride to Downtown Toronto versus an hour (or longer) on the 501 Queen Streetcar. If GO is to be part of Toronto’s transit solution, it should be accessible to local riders. Note that UP Express, with a $27.50 cash fare, is less expensive, per kilometre traveled, than Union to Exhibition via GO Transit. Below, I compared the cost per distance traveled on the Lakeshore West Line, including stops on Route 12, which connects to the rail corridor at Burlington Station. Clearly, the farther one travels from Union Station, the lower the cost is per distance traveled. Until 2012, GO’s annual fare increases were flat fare increases, usually 15 to 35 cents for single fares, with minor discounts for 10-ride tickets and monthly passes. On a $5.00 single ride, the annual fare increase would work out to an increase of 4%-9%, but on a $9.00 ride, the increase would be only 2%-4%. Over many years, the effect of flat fare increases made short rides far too disproportionately expensive. The 2014 base fare, $5.20 increased by 10 cents to $5.30, less than a 2% increase. Single ride fares between $5.21 and $6.50 increased by 35 cents, a 5.3 to 6.6% increase. Single ride fares between $6.51 and $8.25 increased by 45 cents, a 5.4 to 6.9% increase. Single ride fares over $8.25 increased by 55 cents, a 3.1 to 6.6% increase. The Toronto-Peterborough fare, already one of the cheapest in the system per distance traveled, increased by 3.1% while the Union-Exhibition fare, the most expensive fare in GO’s network for distance traveled, increased by 1.9%. Intermediate points, such as Malton and Clarkson Stations, saw the highest fare increase by percentage in 2015. Tiered fare increases, at least in the way that GO Transit is implementing them, aren’t that much fairer than flat fare increases. Even for similar distances in GO’s network, GO’s fare-by-distance scheme isn’t entirely fair. Kitchener Corridor passengers pay higher fares per distance traveled than many other suburban commuters traveling similar distances. GO Transit will most likely raise its fares again early in the New Year, and it will most likely implement another tiered fare increase. But GO Transit, and its parent agency, Metrolinx, needs to completely overhaul its fare structure to promote fare integration throughout the Greater Toronto and Hamilton Area, and to help transform GO Transit from a commuter rail system to a regional transit network, as currently planned with Metrolinx’ Regional Express Rail strategy. GO Transit needs to reduce its fares for short trips, and increase fares for longer distances. This can be phased in over several years if necessary to lessen the impact for its long-distance commuters, but it needs to be done. Furthermore, the TTC and GO Transit need to implement fare integration as soon as possible. Not only do transit riders within the City of Toronto pay disproportionately high fares to take GO downtown, they must pay the full TTC fare to get to the nearest GO station, unlike suburban passengers in York Region, Mississauga, Brampton, and elsewhere who at least enjoy discounted co-fares. If GO Transit finally took the bold step and introduced parking fees, it could use that additional revenue to reduce most fares across the board, focusing especially on short rides. Within Toronto, this would represent a major fare reduction for commuters headed to Downtown. If Metrolinx is serious about fare integration (there’s a fare integration survey taking place right now that I encourage you to respond to), it must start by addressing the inequities in GO Transit’s current fare system. 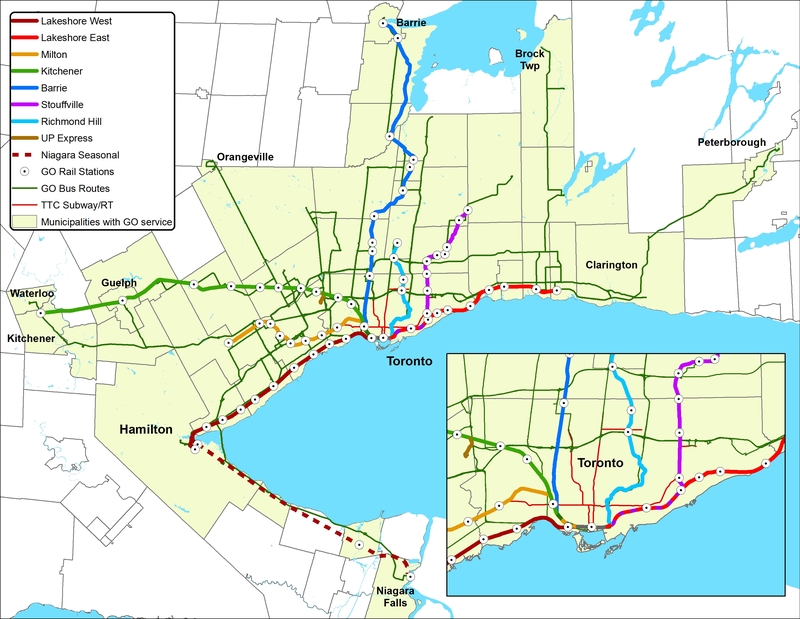 In the next post, I’ll discuss some of the gaps – both large and small – in the GTHA’s transit network. This entry was posted in Maps, Transit and tagged Fares, GO Transit, Transit. Bookmark the permalink. According to reps from Metrolinx the fare integration problem with the TTC comes from the TTC rather than Metrolinx not being willing to implement one. Toronto has no such agreement in place with ANY other system not just the GO lines. I imagine they’re so hard up for cash they balk at losing the money, which is the same reason the TTC is also reluctant to introduce time based transfers. If they get more government funding for the TTC we’ll likely start to see fare integration between the systems! Great article. I’ve felt the same way for a while, but it’s great to see hard data backing this up. One suggestion: change you first graph (GO Transit fares per distance traveled) so that the vertical axis starts at $0 instead of $4. @Cheyenne, I believe Metrolinx gives compensates suburban local transit agencies for the existing co-fare discounts, but they have refused to do the same with the TTC. Metrolinx has publicly stated that their fare system is based on a base fare plus a fare-by-distance component. Did you try to break these two pieces apart? I’m aware that there’s a base fare – $5.30; the Union Station to Exhibition example that I use reflects that. But it’s the base fare itself that’s unreasonably high, and combined with a lack of fare integration with the TTC, that makes GO Transit’s fare policy problematic. But thanks for the suggestion; I’ll look at a few alternative fare structures in a later post. I thought the high base fare was precisely to discourage people from taking short trips on GO (with the implication that there would be a local transit alternative) and taking up space on buses/trains that might be needed for those travelling longer distances. In other words, a deliberate decision. I’ve looked for a map of GO’s zone fares, but unfortunately, there doesn’t seem to be one that’s publicly available, apart from a crude drawing of zones within the City of Toronto in the GO Tariff (http://www.gotransit.com/public/en/docs/Tariff_EN_2015.pdf). For the purposes of this post, I’ve used the station or bus stop locations and the distance traveled by most direct route. I think Go fares should be based, at least partly, on the time it takes to get from Point A to Point B. Some trains in the 905 take quite different amounts of time to get to Union Station. Any train on the Lakeshore Lines gets to Union Station much faster than the milk run from Stouffville. Yet folks in Stouffville pay the same amount to travel. A “fantastic bonanza:” another transit plan up in smoke?